Note: An Additional Per Member Charge is a recurring charge that will be generated on the 1st for a either all swimmers or those in a specific Billing Group. You cannot opt individual swimmers out of this charge. If there are Members that shouldn’t be charged you will need to add a credit invoice against the charge or create a recurring credit to offset this (see links to articles below). Click Membership Dues Schedule > Additional Per Member Charges tabs. Click Add New or click name of existing charge to edit. Enter the Charge Name that will appear on each invoice. Click Select link to right of Chart of Account field. In popup window click Select to right of desired Chart of Account name. 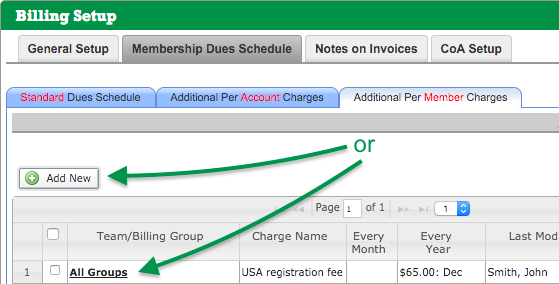 If charge is for a specific Billing Group, choose that Group from This charge applies to Group dropdown. If you want the charge/discount to apply to all Groups but one or two, you will need to create the same charge for each Group to which it applies. Enter Amount to Charge/Discount each Account. Enter a negative amount for discount, such as -12.00. Select Frequency of this charge (Charge Annually on these months allows you to select specific months instead of all 12 months). To delete place a checkmark next to the charge and click Delete. How do I create a per account charge? How do I add a recurring charge/discount to an individual account?